O GOD, our heavenly Father, who by thy Son Jesus Christ didst call thy blessed Apostles and send them forth to preach thy Gospel of salvation unto all the nations: We bless thy holy Name for thy servant John West, whose labours we commemorate this day, and we pray thee, according to thy holy Word, to send forth many labourers into thy harvest; through the same Jesus Christ our Lord, who liveth and reigneth with thee and the Holy Spirit, one God, for ever and ever. Amen. This is how it happened? Well, at least in Matthew’s account. But more importantly what Matthew and Luke and John offer us is a way to think about the meaning of Christ’s Incarnation. We might say that how it happened and how we think about what happened are inescapably intertwined. In fact, we really don’t have any other way to think about the mystery of Christmas than what we are presented with in the Gospels. To be sure, there are the traditions of representation and reflection upon these mysteries that belong to our thinking. But what is most striking and most important about the mystery of Christ’s Incarnation is the idea of God being with us which is simply another way of thinking about the radical nature of God as the principle upon which the being and the knowing of things utterly depends. From such a view, God is always with us. Christ’s Incarnation is the instantiation of that idea simply in its most radical guise. No cause for Christian triumphalism however; only for humility and wonder. Matthew’s account complements John’s outstanding theological vision more than it does Luke’s economical and bare bones story which at face value has nothing really extraordinary about it other than that in the light of John’s Christmas Gospel we are made aware that is what is extraordinary. The ordinariness of the extraordinary event, if you will. Matthew offers us an insight into something he shares with Luke. It has entirely do with angelic sight, the raising of our minds from the linear and divisive thinking of ratio to the unitive reasoning of intellectus into which everything is gathered together. Matthew’s account focuses wonderfully, I think, on the role of the angels in directing the conscience of Joseph. He confronts a conundrum, a social scandal. Espoused to Mary, yes, but lo, and behold, she is with child and not by him! Something of the character of Joseph is suggested to us in Matthew’s equally laconic account, equal to Luke’s concision. “Joseph her husband, being a just man, and not willing to make her a public example, was minded to put her away privily,” discreetly arrange for things, as it were, and not go viral on twitter in the manner of Trudeau and Trump. There is in Joseph’s thoughts – something which we are allowed to see – a question, a sense of mystery, that has to do, perhaps, with his sense of the character of Mary. Simply put, he is perplexed about what exactly is going on. There are, to say the least, questions. 7:00pm Christ Church Book Club – Coronation Room: In Search of a Better World: A Human Rights Odyssey by Payam Akhavan and Tears of Salt: A Doctor’s Story by Pietro Bartola and Lidia Tilotta. ALMIGHTY God, who hast given us thy only begotten Son to take our nature upon him, and as at this time to be born of a pure Virgin: Grant that we being regenerate, and made thy children by adoption and grace, may daily be renewed by thy Holy Spirit; through the same our Lord Jesus Christ, who liveth and reigneth with thee and the same Spirit, ever one God, world without end. Amen. 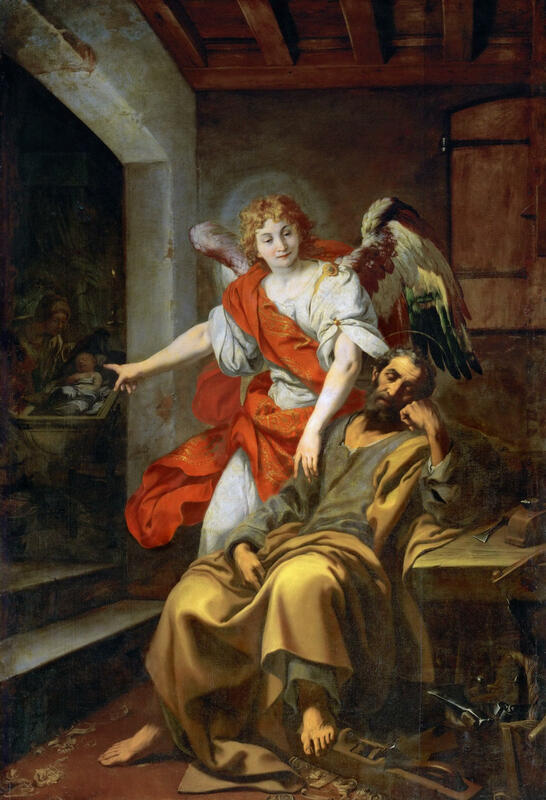 Artwork: Daniele Crespi, The Dream of Saint Joseph, 1620-30. Oil on canvas, Kunsthstorisches Museum, Vienna. Thomas Becket was a close personal friend of King Henry II of England and served as his chancellor from 1155. When the Archbishop of Canterbury died in 1162, Henry, seeing an opportunity to exercise control over the church, decided to have his chancellor elected to the post. Thomas saw the dangers of the king’s plan and warned Henry that, if he became archbishop, his first loyalty would be to God and not the king. He told Henry, “Several things you do in prejudice of the rights of the church make me fear that you would require of me what I could not agree to.” What Thomas feared soon came to pass. After becoming archbishop, Thomas changed radically from defender of the king’s privileges and policies into an ardent champion of the church. Unexpectedly adopting an austere way of life in near-monastic simplicity, he celebrated or attended Mass daily, studied Scripture, distributed alms to the needy, and visited the sick. He became just as obstinate in asserting the church’s interests as he had formerly been in asserting the king’s. Thomas rejected Henry’s claim to authority over the English Church. Relations with the king deteriorated so seriously that Thomas left England and spent six years in exile in France. He realised that he had to return when the Archbishop of York and six other bishops crowned the heir to the throne, Prince Henry, in contravention of the Archbishop of Canterbury’s rights and authority. There is, perhaps, no feast more troubling than The Feast of the Holy Innocents. Yet it belongs to the Christmas mystery and helps to illumine the deeper realities of God’s intimate engagement with our world and our humanity in the child Christ. The story simply shows us what is a continuing feature of our own world; the horrible sufferings and deaths of the little ones in so many parts of our world, the sufferings and deaths of the little ones because of war, the sufferings and deaths of the little ones because of what is expedient and useful for the interests of others. In other words, there are a myriad of innocent ones. Innocent simply means those who are not able to harm. In the Christian story, the little ones of Bethlehem are destroyed by Herod in his attempt to get rid of a potential rival to his throne. The story, too, draws upon the Egyptian captivity of Israel and God deliverance of Israel by God. The Hebrews are drawn out of Egypt and learn to be defined by the Law in the wilderness. So, too, Christ with Joseph and Mary flees Bethlehem and goes into Egypt from which he will return. Fuga in Egyptum, “the Flight into Egypt,” as the Matthaean story is called has excited the imaginations of the artists. The angel of the Lord alerts Joseph in a dream about the danger the young child and his mother are in. They flee into Egypt. Meanwhile back in Bethlehem, we have the slaughter of all the little ones just because they are little ones. It is a policy of infanticide enacted for a political purpose. Sadly, there is nothing new in that: think about the horrors of the Rwandan genocide or the present horrors of the Syrian civil war, of the flood of refugees, etc., etc. What is the point? What is there to celebrate? What are we celebrating? The meaningless and cruel deaths of little children? Cruel deaths, yes, but The Feast of Holy Innocents makes the strong theological claim that such deaths are not meaningless, that such deaths actually participate in Christ’s coming, including his death. Their lives have their meaning entirely in Christ. It means, too, that the sufferings that arise so directly from human folly and wickedness in all its forms are known to and in God. The simple “givenness of things,” to use Marilynne Robinson’s phrase, embraces the suffering of all things, both gentle and violent. The suffering of all things belongs to the being of God. Think about how poignant and powerful this story might be precisely for those who have lost little ones. I have had occasion in the priestly and pastoral ministry to deal with those who have lost a child at childbirth or shortly thereafter. What comfort can there be except to recall this feast which makes it clear that the little ones ultimately are those who “follow the Lamb,”a reference to Christ in his sacrifice for us, “whithersoever he goeth”? He goes ultimately to the Cross for us and for our salvation. The holy Innocents are “they which follow the Lamb whithersoever he goeth.” There can be no other comfort. When wise men from the East visited King Herod in Jerusalem to ask where the king of the Jews had been born, Herod felt his throne was in jeopardy. So, he ordered all the boys of Bethlehem aged two and under to be killed. On this day, the church remembers those children. The Massacre of the Innocents is recorded only in St Matthew’s Gospel, where it is said to be fulfillment of a prophecy of Jeremiah. The church has kept this feast day since the fifth century. The Western churches commemorate the innocents on 28 December; the Eastern Orthodox Church on 29 December. Medieval authors spoke of up to 144,000 murdered boys, in accordance with Revelation 14:3. More recent estimates, however, recognising that Bethlehem was a very small town, place the number between ten and thirty. This episode has been challenged as a fabrication with no basis in actual historical events. James Kiefer has a point-by-point presentation of the objections with replies in defence of biblical historicity. This is an appropriate day to remember the victims of abortion. 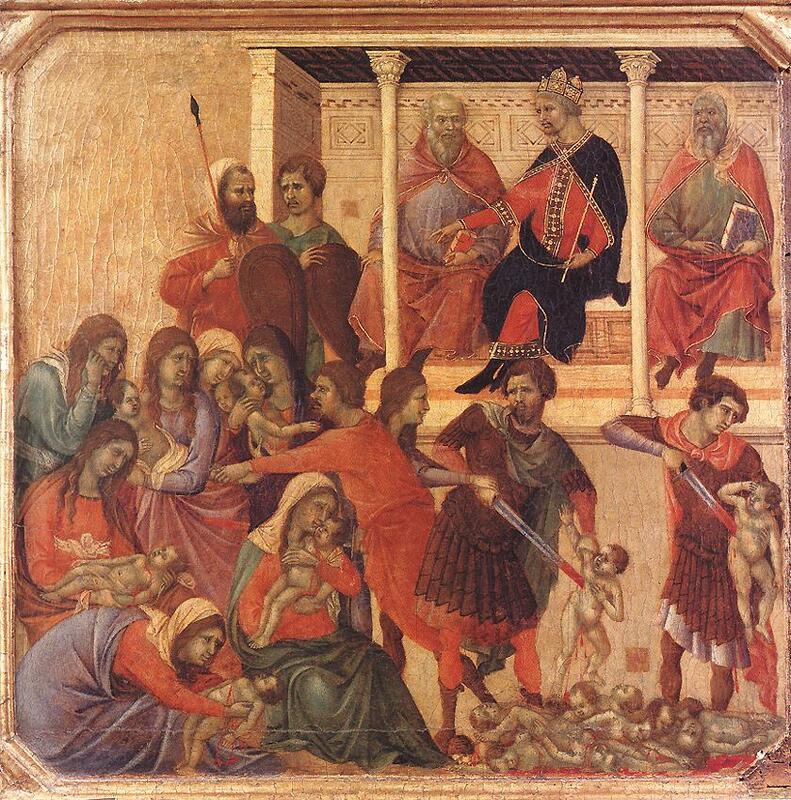 Artwork: Duccio di Buoninsegna, The Massacre of the Innocents (from front predella of the Maesta), 1308-11. Tempera on wood, Museo dell’Opera del Duomo, Siena. The Feast of St. John the Evangelist complements powerfully the essential Christian mystery of the Incarnation expressed in The Prologue of John’s Gospel on Christmas Eve. The reading from John’s first letter underscores the essential insight into the Incarnation. It is written to emphasize the reality of God being with us in the incarnate reality of Jesus Christ. It counters what will become the earliest Christian heresy, docetism, which argues that God could not become flesh, could not engage the world intimately; he only appears to have done so but not really. As such it plays into all the forms of gnosticism, ancient and modern, which see the world in largely dualist terms: spirit, good, matter, evil. Our own culture is riven with dualisms of this sort both politically and environmentally. We have, I think, the hardest time understanding and appreciating the essential goodness of everything in the created order and end up attributing to the goodness of creation an evil which actually belongs to us and to our “thoughts, words and deeds”. How we use the created world is the real question. Christ’s Incarnation is the strongest possible affirmation of the goodness of the world, of matter, of the flesh, of the body. But even more, the Incarnation is the strongest possible affirmation of the truth of God in whom the truth and being of all things radically depends. The Gospel too complements the point of the Epistle. Not only is Christ’s Incarnation and all that follows from it, such as the Resurrection, real and not merely an appearance, a kind of divine play-acting, as it were, but “the world itself could not contain the books that should be written,” John says, about the “many other things which Jesus did.” In other words, the Incarnation does not mean that God is collapsed into the world, rather the world is gathered into the radical truth of God. This affirms the goodness of the created order but only in relation to God. Christ is “God and Man,” the creeds say, and that union contains a wonderful insight into God and to God with us. Christ, as the Athanasian Creed puts it, is “God and Man, yet he is not two, but One Christ, One, however, not by conversion of Godhead into flesh, but by taking Manhood into God.” Such an insight proclaims a deep truth that counters all the forms of our dualism. It is what Christmas proclaims and celebrates, the deep meaning of Emmanuel, God with us. John emphasizes in his Epistle what he shows in his Gospel. “That which was from the beginning” is the Word, “the Word [which] was with God and was God,” “the Word [which] was made flesh”, the Word “which we have heard, and seen, and looked upon and handled”. The Word of Life. That Word “we declare unto you”, John says, “that you may have fellowship with us” in “our fellowship with the Father, and with his Son Jesus Christ.” This is our Christmas joy, and the fullness of joy. This is the light that overcomes all darkness. “God is light and in him is no darkness at all.” Such is the great and radical witness of the Christmas mystery. We celebrate the double mystery of God and of God with us only to realize that God with us is precisely the mystery of God himself. John and his brother James (St. James the Greater) were Galilean fishermen and sons of Zebedee. Jesus called the two brothers Boanerges (“sons of thunder”), apparently because of their zealous character; for example, they wanted to call down fire from heaven on the inhospitable Samaritans. John and James, together with Peter, belonged to the inner group of the apostles who witnessed the Transfiguration and the agony in Gethsemane. It was John and Peter whom Jesus sent to prepare the final Passover meal. In the lists of disciples, John always appears among the first four, but usually after his brother, which may indicate that John was the younger of the two. According to ancient church tradition, St. John the Evangelist was the author of the New Testament documents that bear his name: the fourth gospel, the three epistles of John, and Revelation. John’s name is not mentioned in the fourth gospel (but 21:2 refers to “the sons of Zebedee”), but he is usually if not always identified as the beloved disciple. It is also generally believed that John was the “other disciple” who, with Peter, followed Jesus after his arrest. John was the only disciple at the foot of the cross and was entrusted by Christ with the care of his mother Mary. After Christ’s resurrection and ascension, John, together with Peter, took a leading role in the formation and guidance of the early church. John was present when Peter healed the lame beggar, following which both apostles were arrested. After reports reached Jerusalem that Samaria was receiving the word of God, the apostles sent Peter and John to visit the new Samaritan converts. 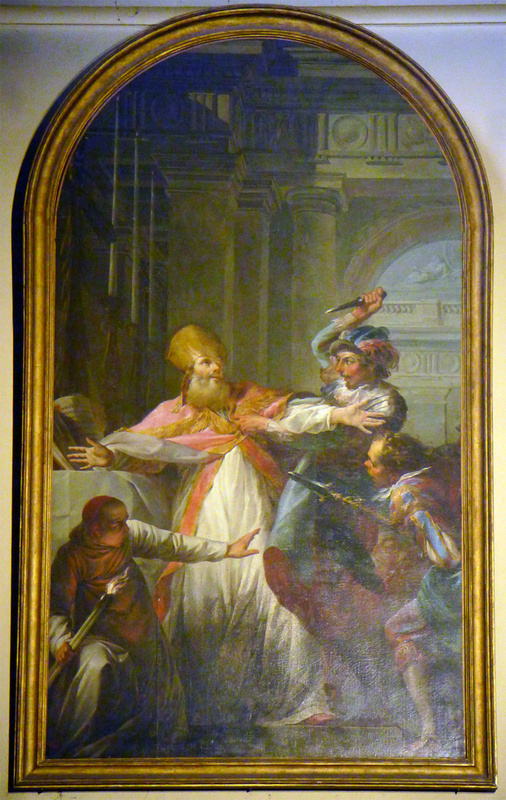 Presumably, John was at the Jerusalem Council (Acts 15). He is not mentioned later in the Acts of the Apostles, so he appears to have left Palestine. “Love is in the nature of a first gift through which all gifts are given,” Aquinas notes. We live for the one who gives himself for us. The Feast of St. Stephen reminds us with great clarity about the real meaning and purpose of Christ’s holy birth. He comes as Saviour. He comes as the Lamb of God. He comes as sacrifice. Such is the real and deep meaning of love. To come “in the Name of the Lord” is not to act in our own interest, in our own name. It is to bear witness to another; in short, to God in Christ. A martyr is essentially one who bears witness to the truth of God. In its extreme form that witness is even unto death. The celebration of The Feast of Stephen on the day immediately after Christmas is no accident of time. Nothing emphasises more completely the deeper meaning and wonder of the Christmas mystery and its application to us in our lives. “In his master’s feet he trod,” as the ancient medieval Carol, Good King Wenceslas puts it, and “on the feast of Stephen”. Christ comes to us so that we may come to him. Our blessedness lies in our coming, our doing and thinking all things “in the Name of the Lord.” This emphasizes yet again the radical meaning of Christmas. It is about the presence of God in our world now and always. It is about our witness to the truth that God is always God and always divinely like himself. Our good is found in him, in the one who comes, in the one who is Emmanuel, God with us. Like St. Stephen, we seek the echoing of Christ’s words of sacrificial love in us. That is the blessing, the deep blessing of Christmas.